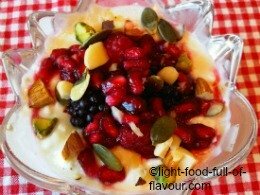 It’s the crunchy nuts and seeds that make this berries and nuts breakfast dish irresistible to me – that and everything else I add to this concoction. It’s also really easy to make and an excellent breakfast to take with you if you haven’t got the time or the appetite before leaving for work. I and my big appetite would add a piece of sourdough bread as well, with a tasty topping. A healthy and filling breakfast should contain protein, low GI carbohydrates and healthy fat from sources such as avocado, nuts and seeds. And it should preferably taste great as well! This berries and nuts breakfast fills all of the above mentioned criteria. As I have decided to stop using “light” versions of food - they often have added sugar, salt and additives - I am using full-fat cottage cheese. I combine this with natural soya yogurt. All nuts and seeds are healthy - full of vitamins, minerals and dietary fibre - and are protein rich which helps to fill you up. Pecan nuts have really high levels of antioxidants. And eating just three Brazil nuts per day gives you all the selenium you need. This mineral is crucial for a strong immune system. It also makes detoxifying enzymes in the liver and acts as an antioxidant. Roughly chop the nuts. Mix the cottage cheese and soya yogurt. Top with the berries, pomegranate seeds, seeds and chopped nuts.